The year is 2044 AD, and the artificial intelligence known as G.O.R.E is on the verge of destroying humanity! Those that survive are assimilated into its murderous horde of Blood Mechs™! One man - a priest - armed only with his faith and indomitable will has the power to resist, and turn G.O.R.E's murderous machine against him! Or is that 'it'? Whatever! Save humanity! Destroy all in your path! So sayeth the Lord! 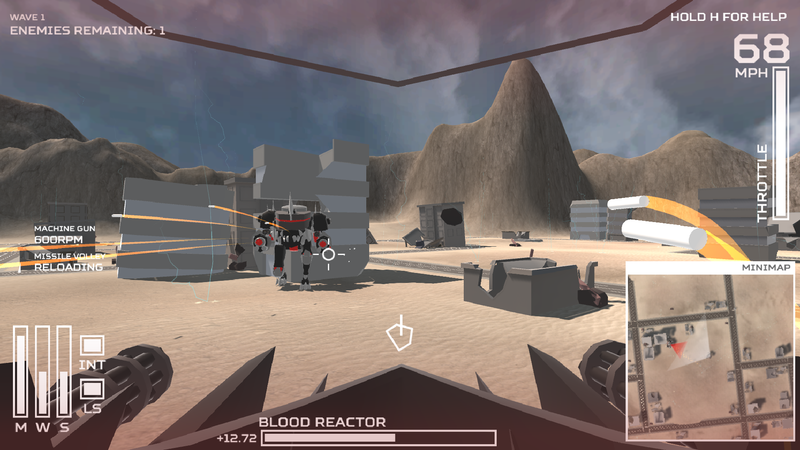 Control your Blood Mech to defeat the waves of enemies. Manage your reactor power carefully, and use your shields to avoid loosing too much blood. 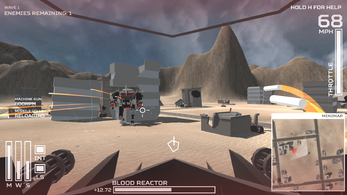 Taking damage to your BLOOD REACTOR will lower your maximum available BLOOD. Deploy your SHIELD to block damage to your BLOOD REACTOR. Manage your POWER CONSUMPTION! Firing weapons, using shield, and taking hits to your shield consume the most power. Use the POWER CONTROL PANEL to modify BLOOD levels to your systems. Disabling LIFE SUPPORT gives power boost but you’ll take damage after 10 seconds! 2044AD and the artificial intelligence G.O.R.E has nearly enslaved all of humanity into his fleet of dreaded Blood Mechs. You are one man, who through your iron will, was strong enough to wrest control of your machine. Fight back, destroy G.O.R.E and free humanity! this games remember me mechwarrior, but i think you can add customization and another mecanics to make this game a perfect mech simulator.